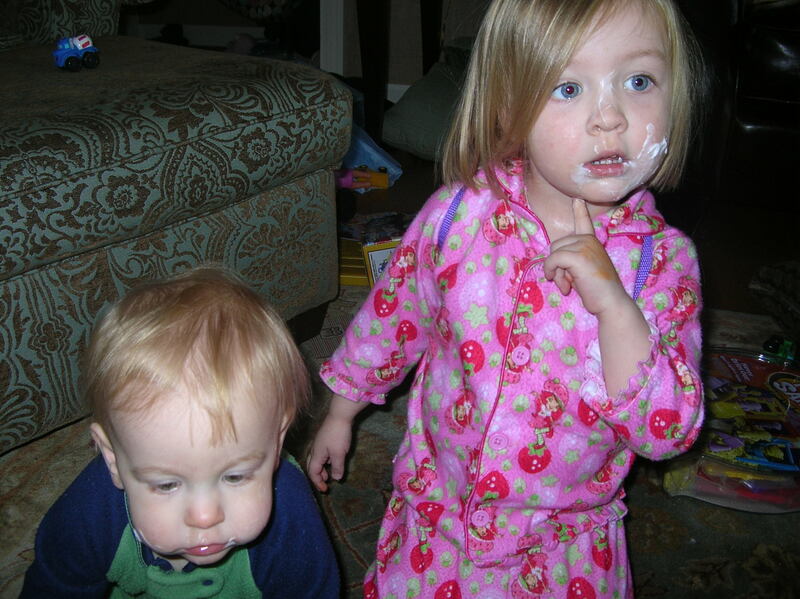 Chloe loves chapstick and “cream” (face cream/lotion). 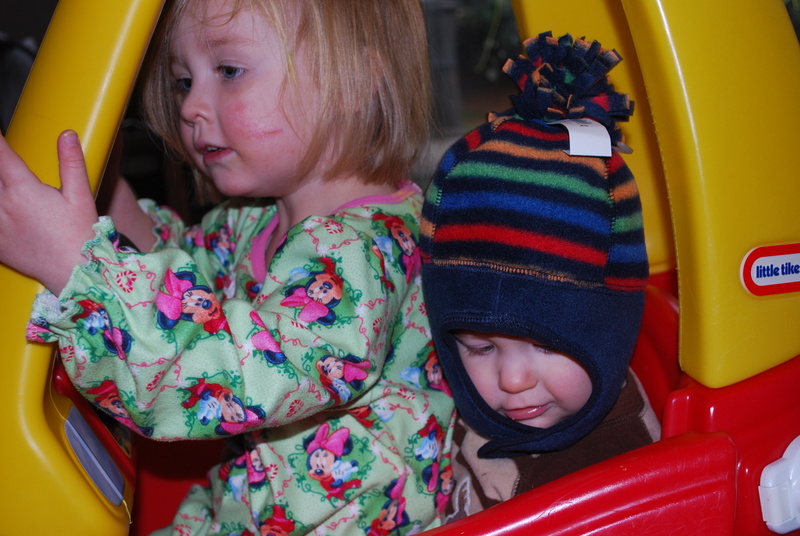 Both Chloe and Cole have very sensitive skin, especially in the cold weather. We have to keep them both covered in Aquaphor during the winter months. Chloe thinks it is a treat to wear “cream,” and every night before she goes to sleep, she will remind me if I’ve forgotten to put “cream” on her face. 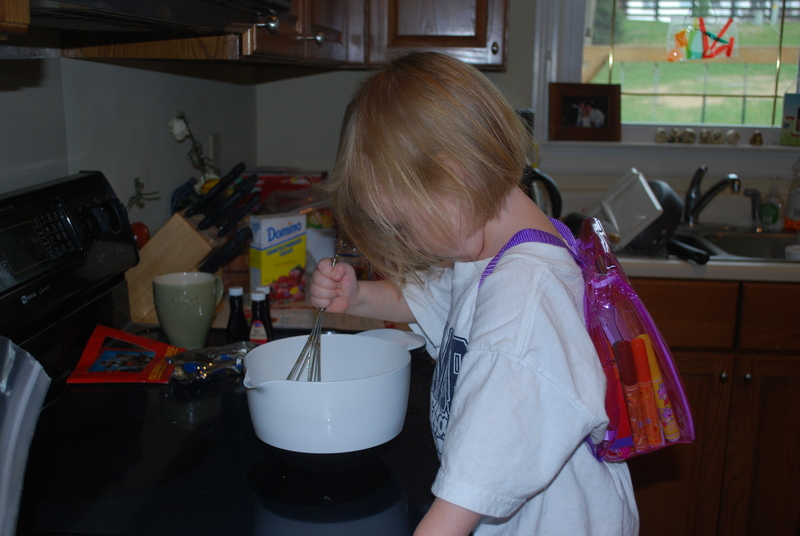 It was actually a great reward to use while she was potty training. Dad is back in the hospital this week, so most of my week has been spent there as well. Luckily, Matt was able to work most of the week at home so I could be at the hospital. But, trying to work at home with two toddlers isn’t the easiest of tasks. 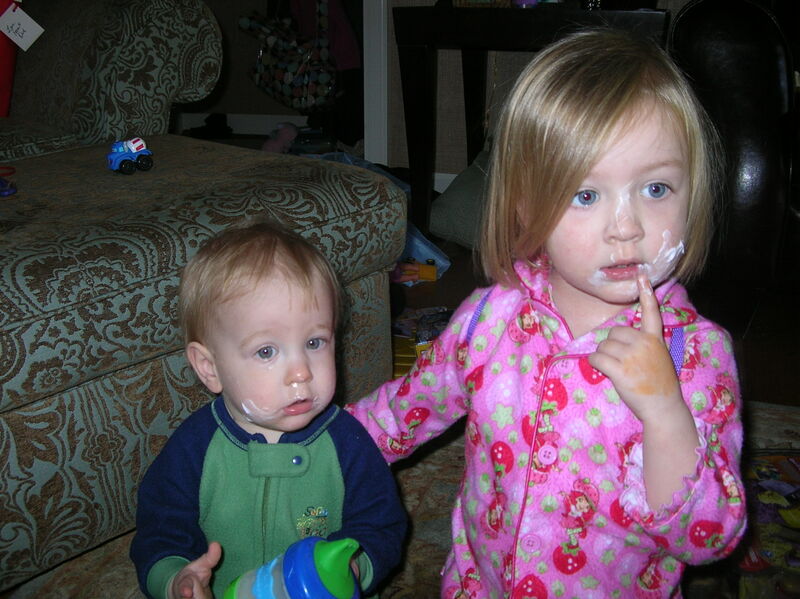 Matt got busy, forgot about his two kids for a second, and walked in to find Chloe in the “cream,” and she thought Cole needed some too. The Stroups were all in town, and they had a party to celebrate. 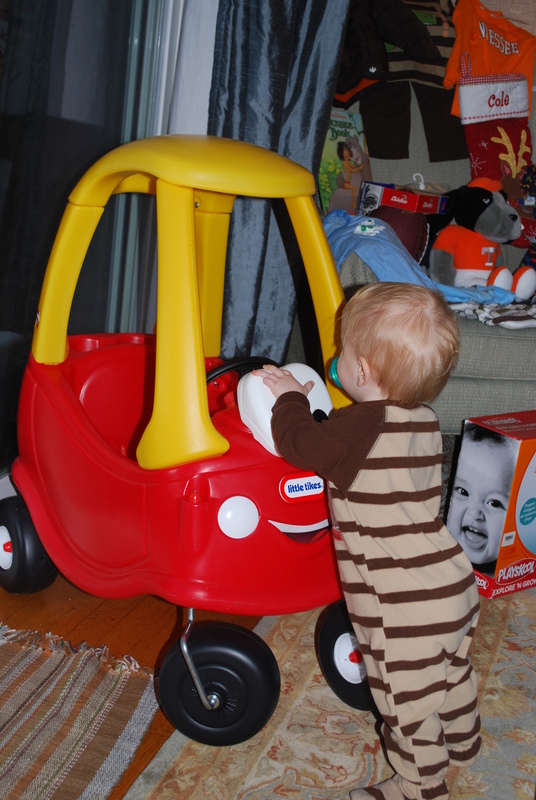 As soon as we returned home from Pappy and Papa’s, we quickly unloaded the car and headed out. Whew! The hustle and bustle! We had a great time seeing everyone, and the only time my camera made it out was to get a few shots of Cole taking his first bath with a girl other than his sister. You can imagine the jokes that were going around over that…. mostly about Cole being a stud. Guys are so crazy. 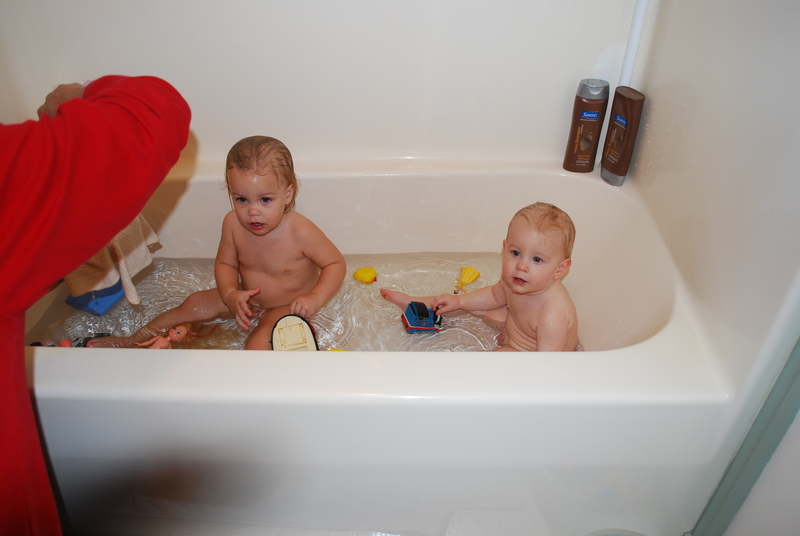 But, Cole and Willa had a great time playing in the tub, and thank you Mr. Steve for bathing them. 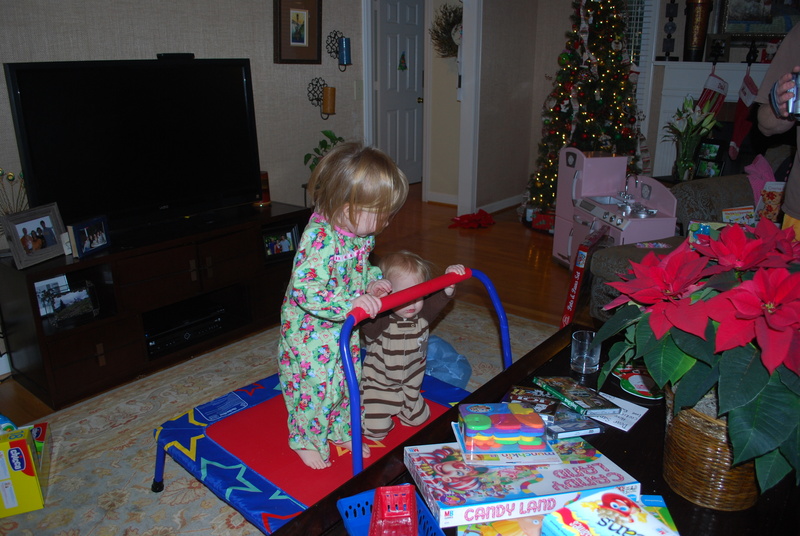 Chloe had so much fun with Lucy, and she did not want to leave at the end of the night….. as usual. She’s our social butterfly. 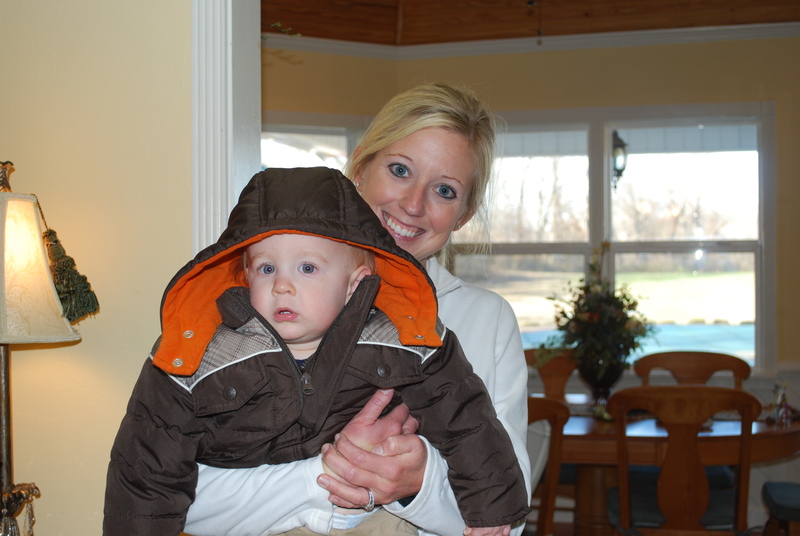 It was lots of fun hanging out with the Stroup clan, their kids, and their friends. It just doesn’t happen often enough! 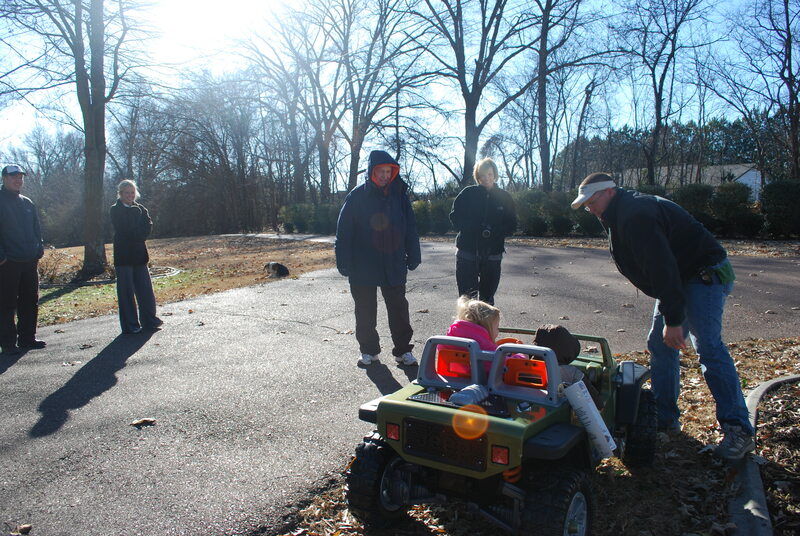 We made to Pappy and Papa Rod’s house by about 4:30 Christmas afternoon. Not bad after our full morning/lunch! Neither kid napped well on the way, so I knew we could possibly be in for trouble before too long. 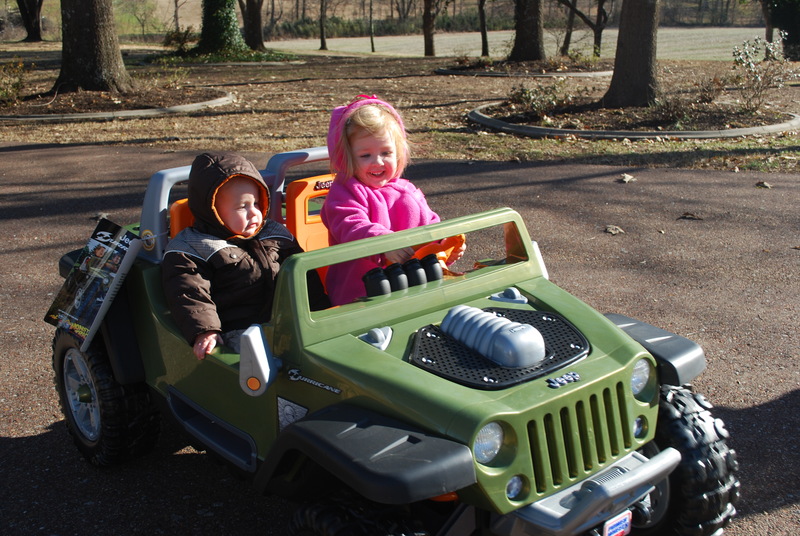 When we got to Mom and Dad’s, they were just getting in from B-Bob and PawPaw’s. Dad wasn’t feeling well, so he laid down. 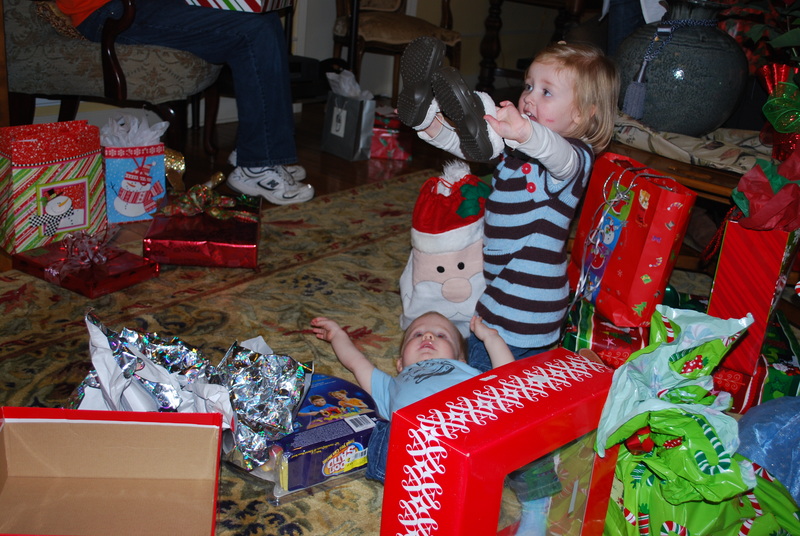 We tried to get Chloe and Cole to lay down as well, but to no avail. 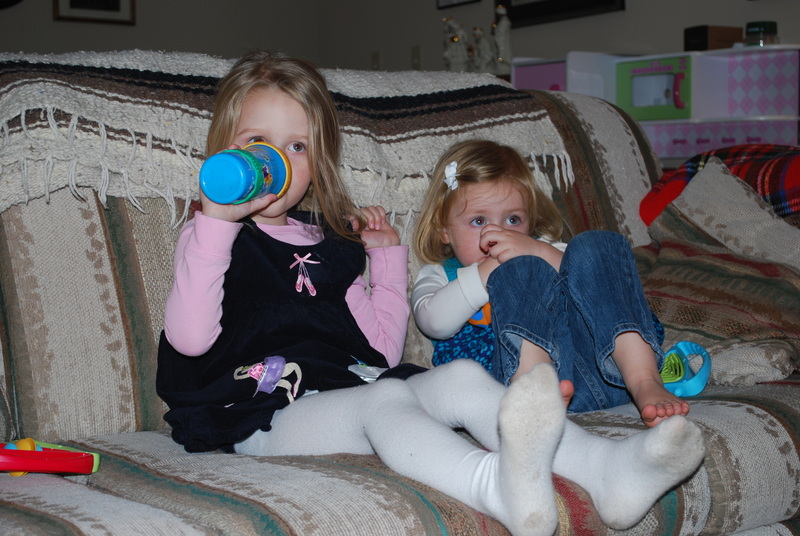 When Dad awoke, we called Grandan to come over, and Austin and Dana came over. We ate dinner, but it was quite chaotic. 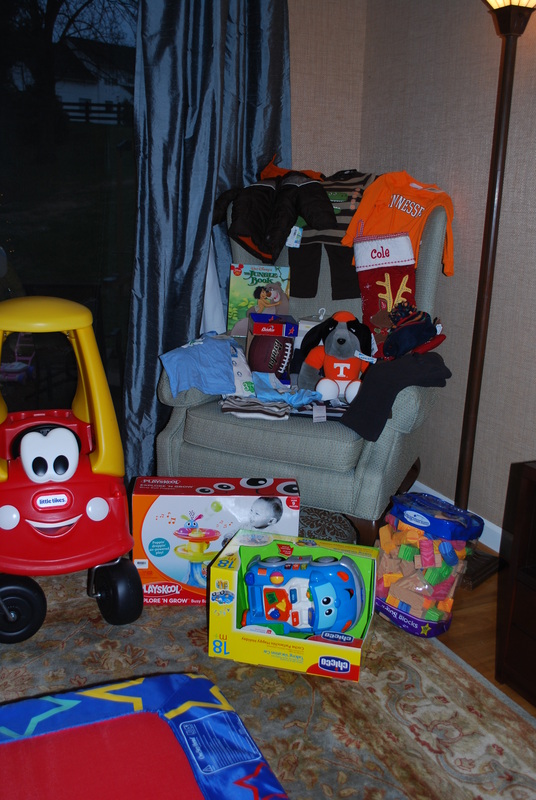 Chloe’s gotten the hang of this “Christmas thing,” so she knew she had presents awaiting. 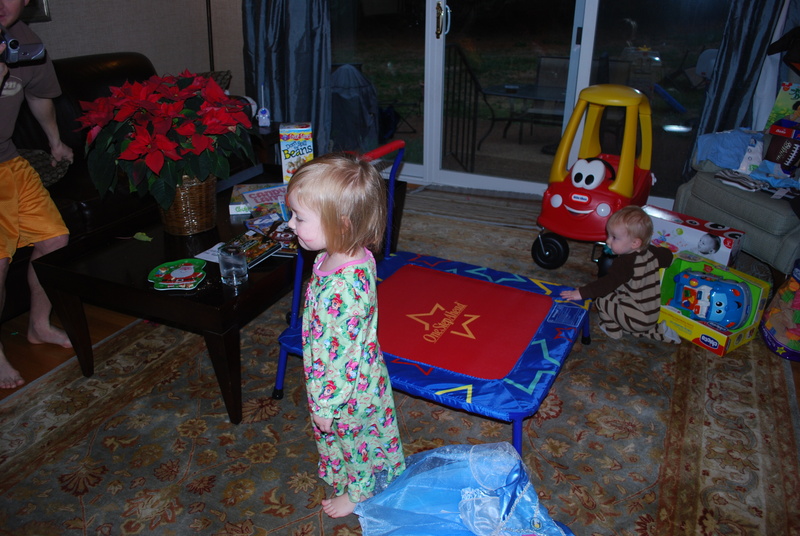 If dinner was chaotic, opening presents was even more so. 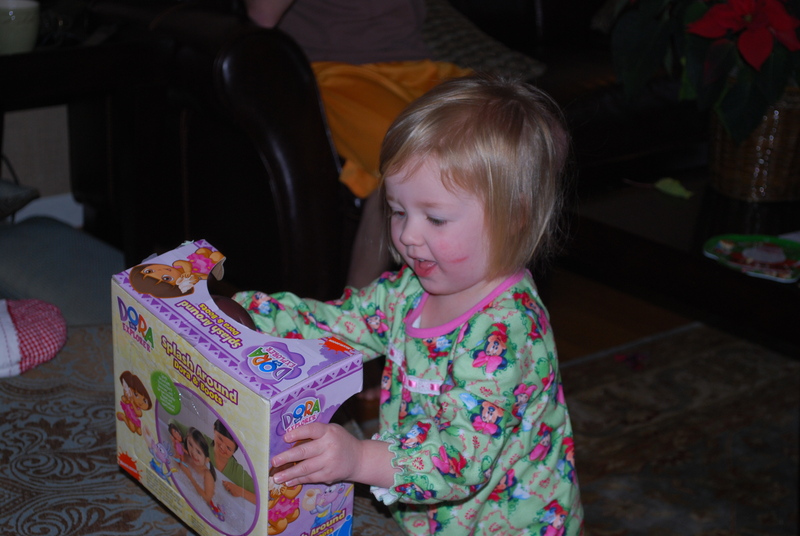 Chloe screamed and squealed over everything she opened. Where in the world did she learn that?!? Matt started the festivities with diaper duty. Hmmm….. I think someone should have listened to her mommy and taken a better nap! 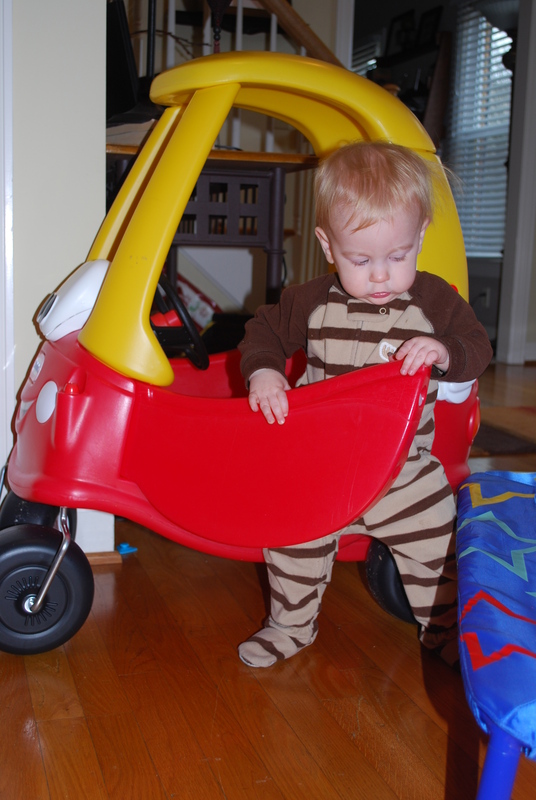 As usual, Cole was crawling/walking/falling down in the middle of everything getting in everyone’s way. Chloe was very proud of her new princess shoes and skirt. 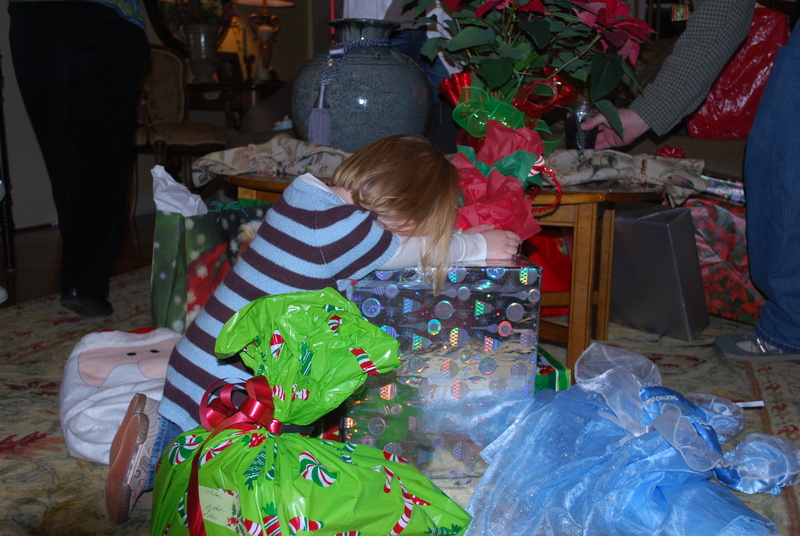 After opening most of the presents, we had to call the night short, and everything ended up falling apart all of a sudden. 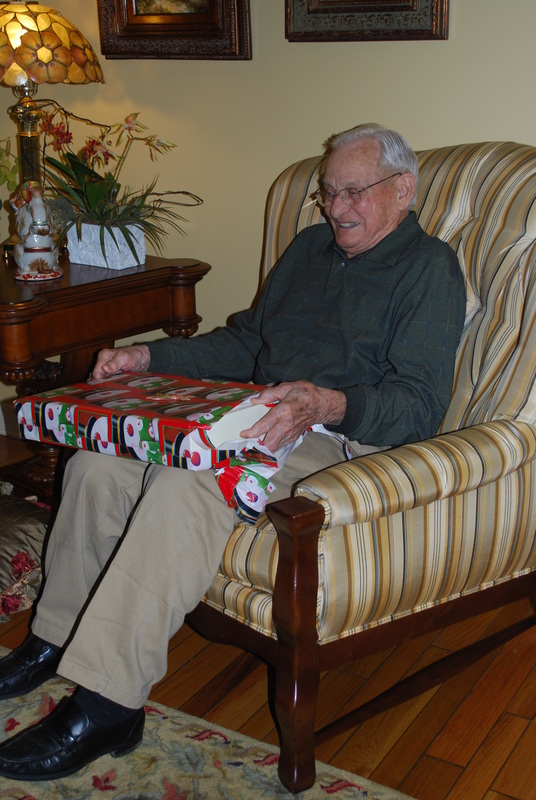 Dad was not feeling well, so we got him to bed, packed everything up, and prepared for a trip to Vandy leaving the next morning; however, getting sick on Christmas day/weekend is not the best time to get sick. After talking to the on-call doctors, we decided not to leave and to just stay put and monitor Dad closely. 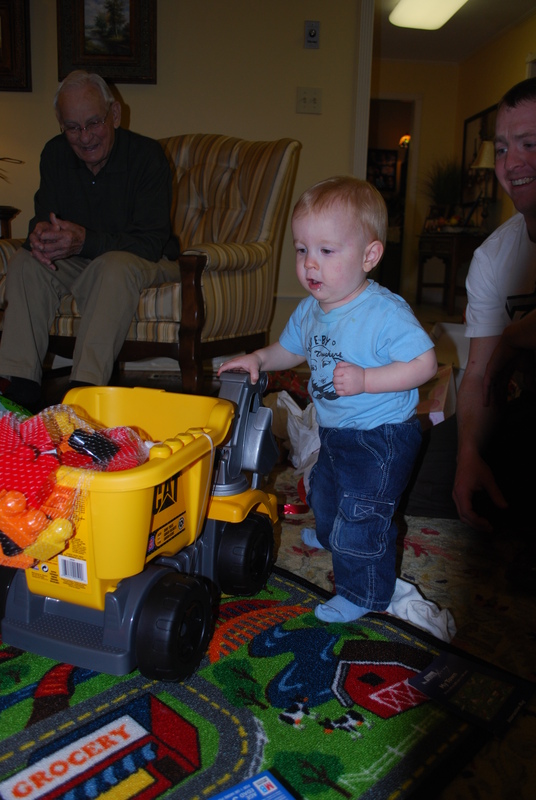 Austin and Dana came back over Saturday for lunch, and we woke Papa Rod so he and Pappy could give Chloe and Cole their big present…. 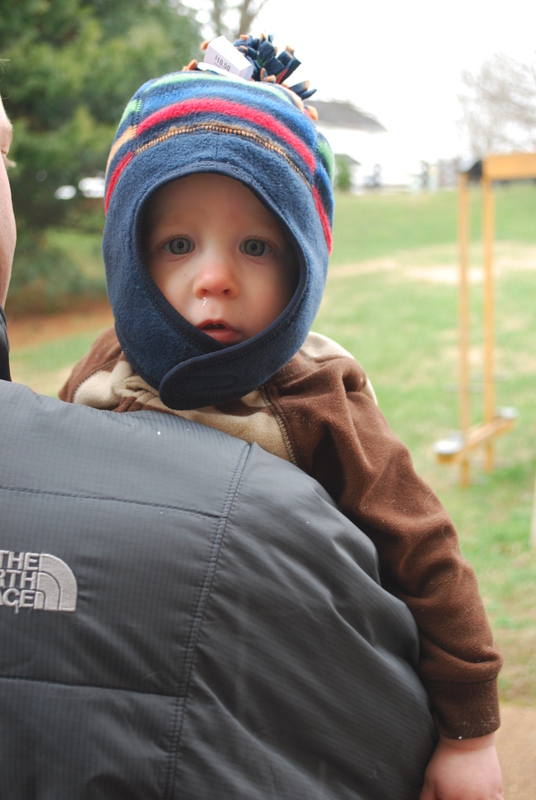 So, we dressed the kids in their gear….. 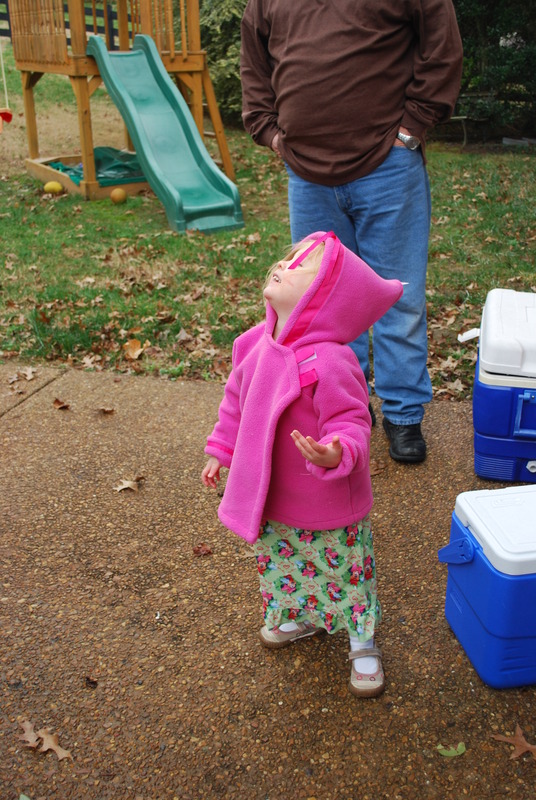 But they perked right up when they walked outside to see what was waiting on them…. 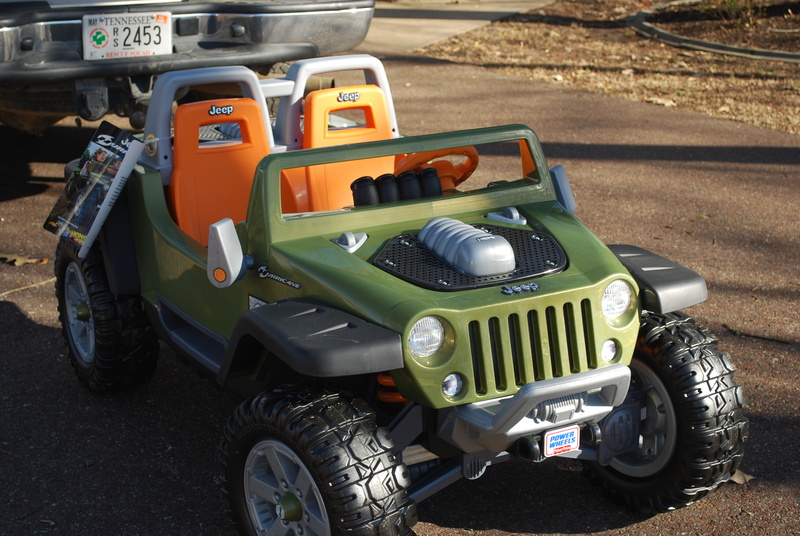 a Jeep from Pappy and Papa Rod! The radio was blaring and it was ready to go! 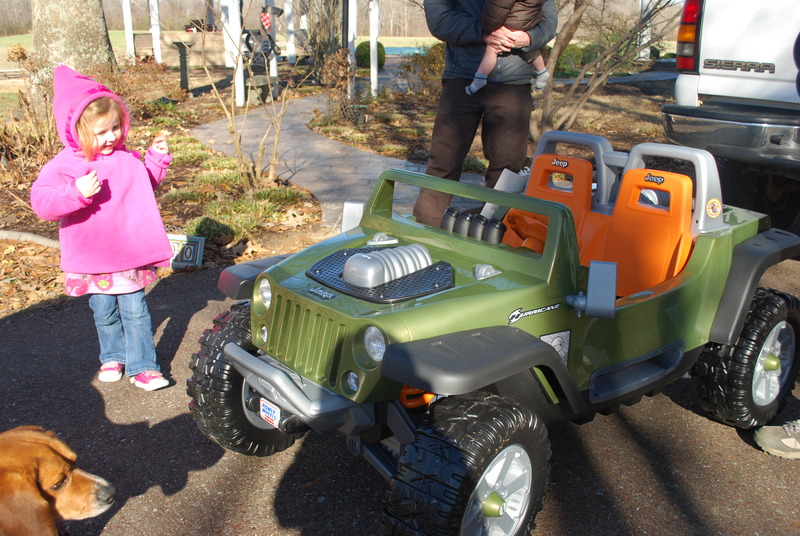 Matt said their battery-powered Jeep was nicer than his first car. 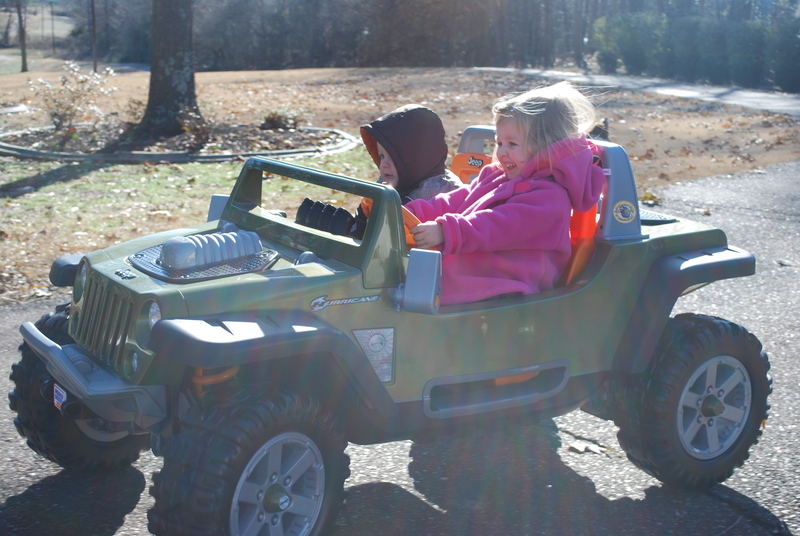 Austin and Matt really worked with Chloe teaching her how to drive, and she did pretty well. She likes to punch the gas for a couple of seconds and then stop. It was difficult trying to explain to her that if she held down the gas, she would continue to move. 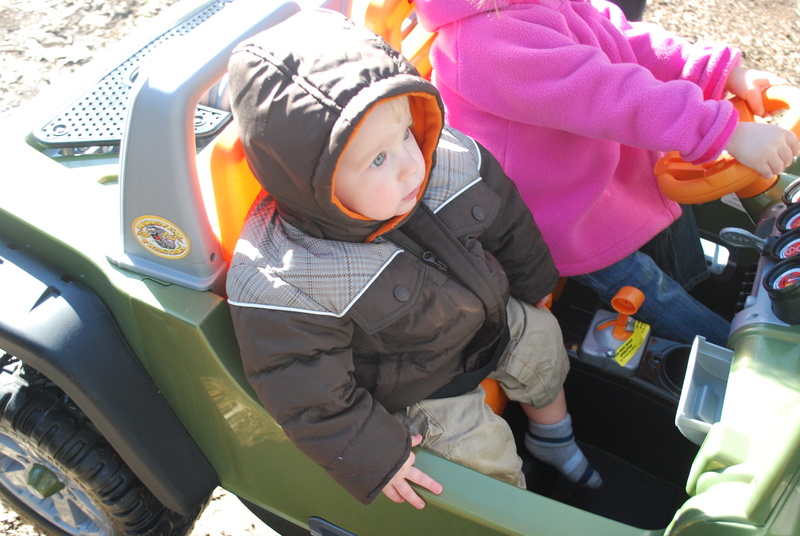 Cole’s little feet don’t even touch the bottom. Ha! We had to go inside because it was so cold, and Chloe cried. She was not ready to come in, but it was naptime. Once Chloe settled down, she, Cole, and Papa went to bed, and they all got a good nap. 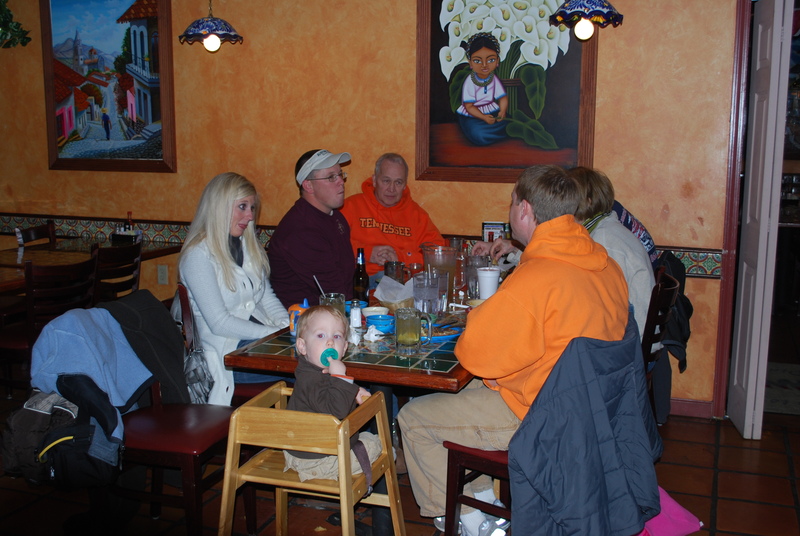 After naps, we all decided we’d like to head out and eat some Mexican. 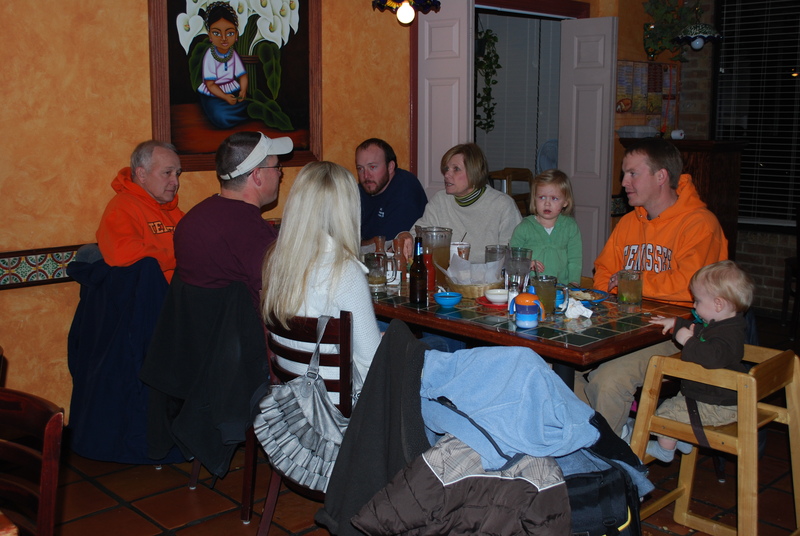 Good ol’ family time over some good ol’ Mexican food. Does it get any better? It was a nice weekend, and we all enjoyed being together, but it was different. It was very different. Christmas just wasn’t the same. Cancer was with us this year at Christmas, and oh how I wish it would just leave us alone. But it was there…. when we ate, when we opened presents, when we talked. It was there and it robbed us. I want it to go away. It affects everything, and it let us know it was present. Dad wasn’t feeling well the entire weekend or the week before. Cancer wouldn’t even give us a quiet Christmas. What a cruel, ugly, terrible thing it is. But, I don’t want to end on that note. It’s Christmas, and even though cancer is amongst us, there is a lot cancer can’t do! We still have each other, and we were still together this weekend through all the mess thrown our way. Cancer can do many things, and try as it may, but it can’t and it won’t destroy our family, our love, our togetherness, our hope. We are bigger than cancer and we are better than cancer, and we are showing that every single minute of every single day. Go Dad and Merry Christmas! As usual, Cole awoke first, so we moved him to our bed and wrestled him as long as we could. Finally at 7:30 we had to wake Chloe, and she was completely out of it. 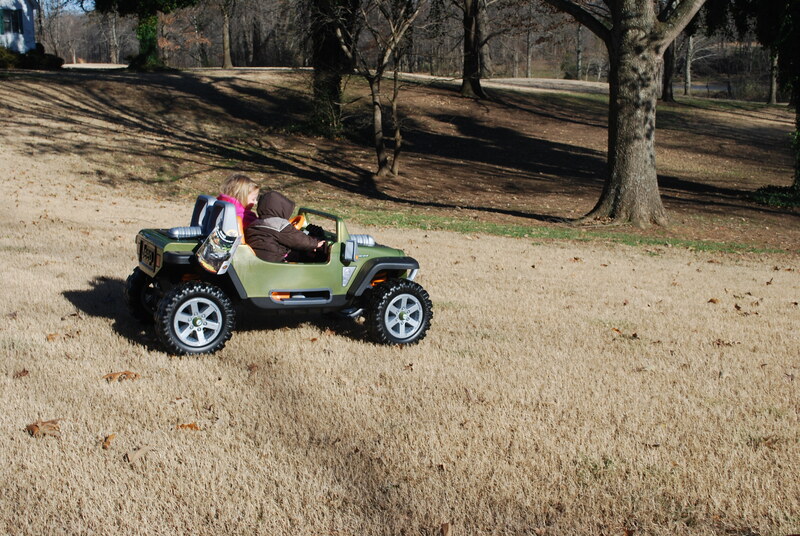 After we reminded her that Santa had visited, she snapped out of it pretty quickly. 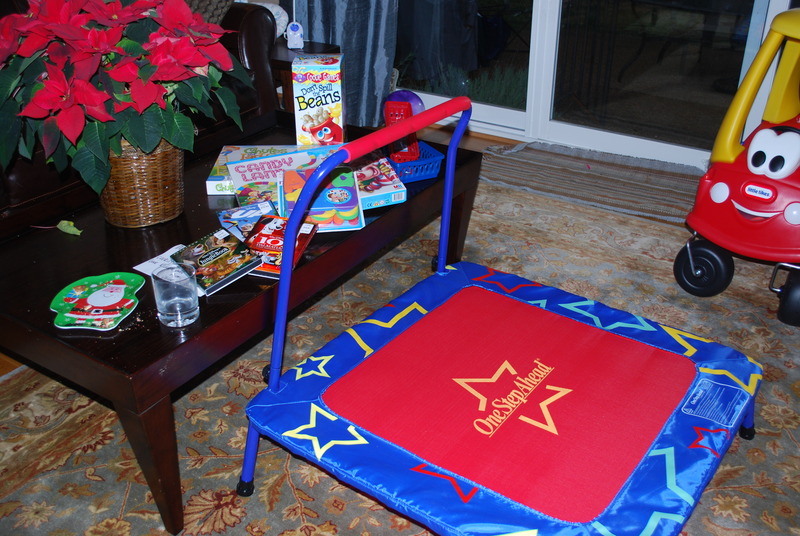 I ran downstairs quickly to take some pictures of what Santa had left. 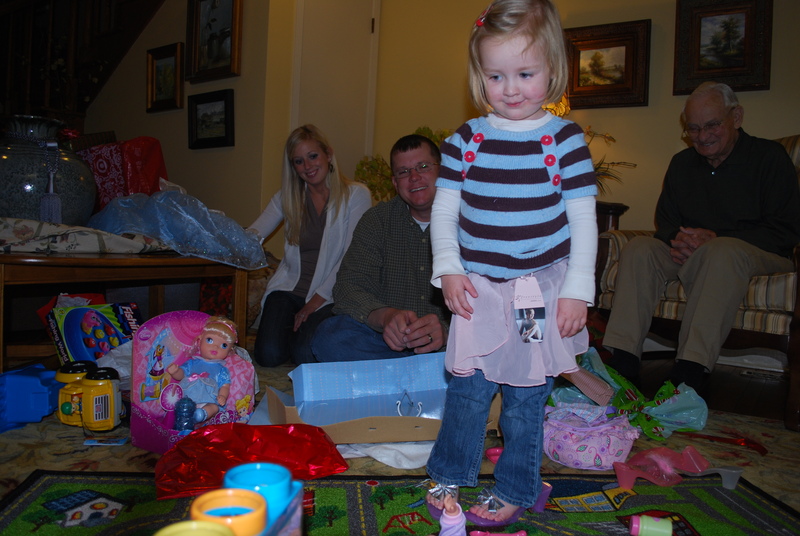 Everyone was walking downstairs, and I don’t think Chloe saw her presents until she walked right upon them. Then, she just stopped and stared, mouth wide open. She remained that way for several seconds, and then she became very excited. 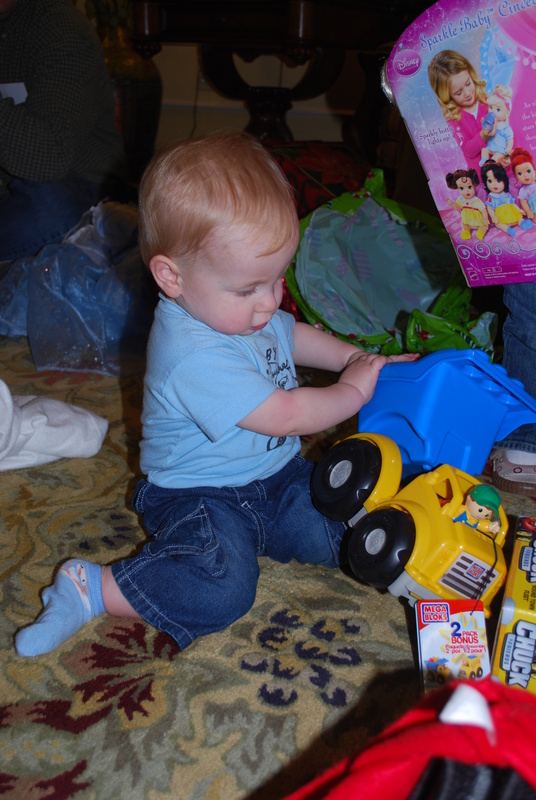 Cole crawled right over to his pile and started playing. He knew exactly what pile was his. We played all morning, and Matt and I drank coffee and cooked all morning. 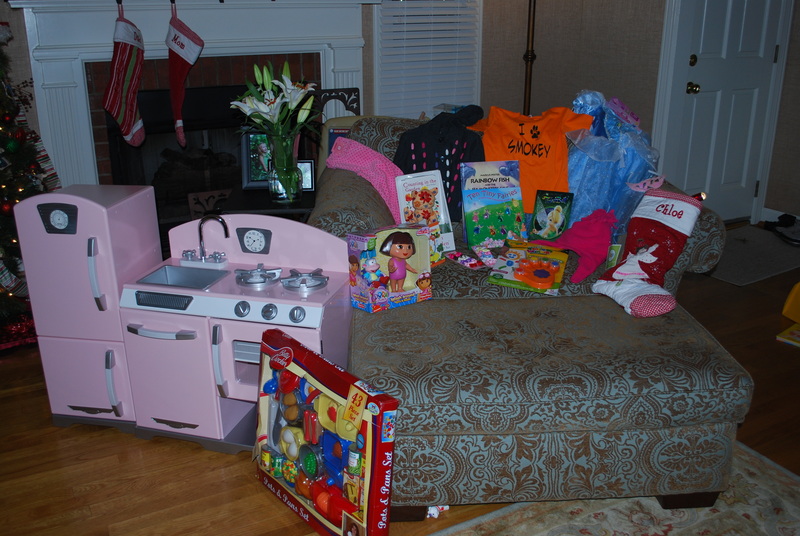 Ninnie and Big Poppa came over to see what all Santa brought the kids. I looked out the window and noticed it was snowing!! 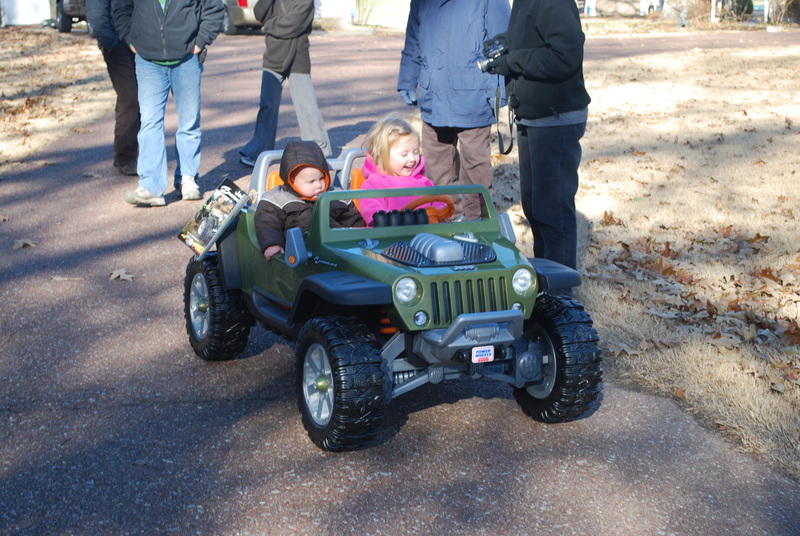 So, the men threw new coats, mittens, and toboggans on the kids and took them out. It was snowing so lightly that it didn’t even show up in the pictures, but a little snow is better than no snow! 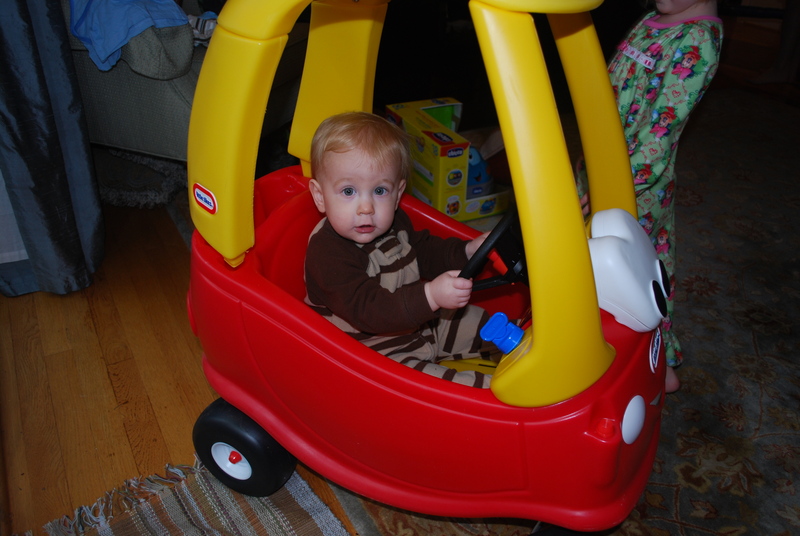 Look at Cole’s sweet, little, droopy, tired eyes…. and runny nose…. little do we know….. that runny nose will turn into more things and give us FITS for the next two weeks. Ninnie and Big Poppa stayed with us for lunch, and we feasted on a smoked turkey, dressing, green beans, cheese grits, and rolls. Yum! 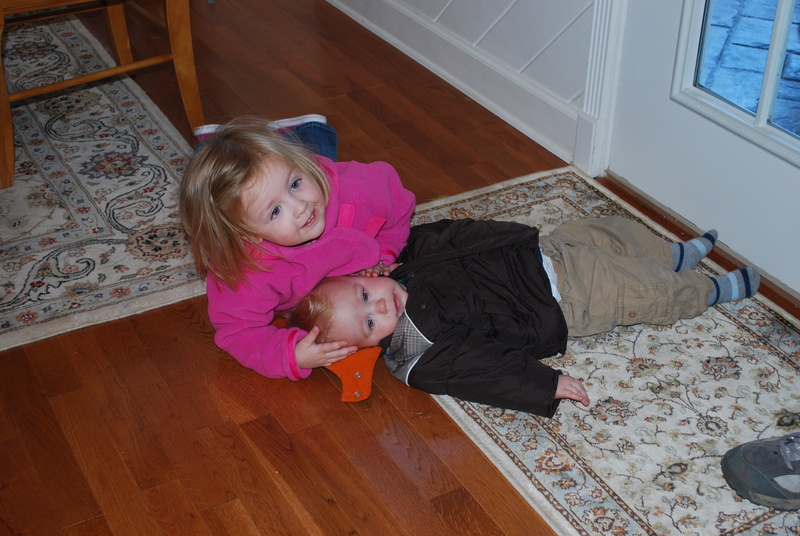 When lunch was over, Chloe and Cole both were absolutely worn out. 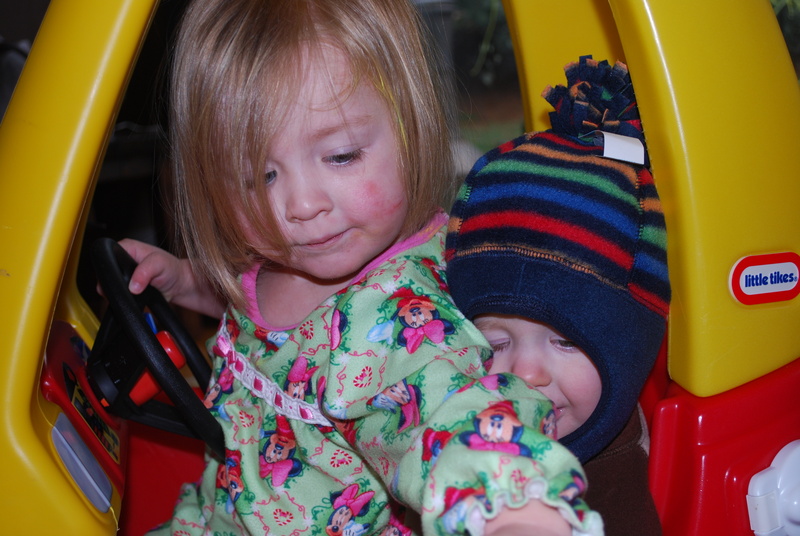 They were both tired, cranky, and out of control. 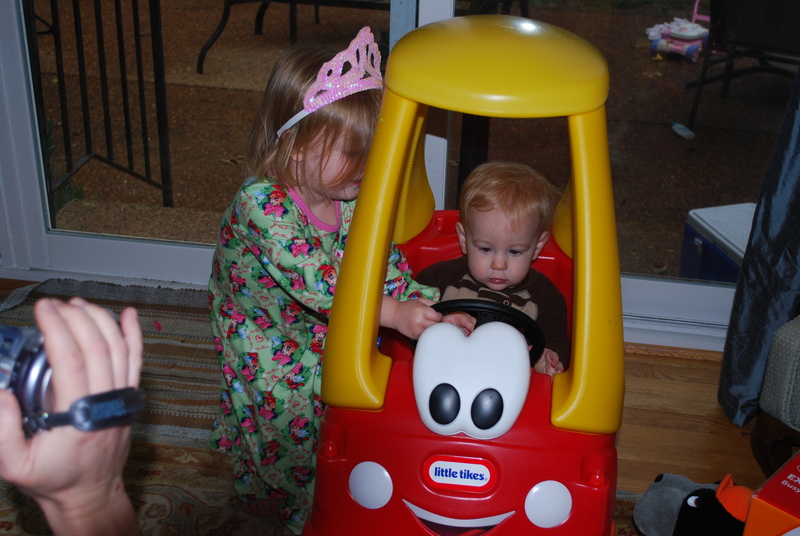 They began fighting over Cole’s new car, and somehow, they both fit…. but each was equally unhappy. 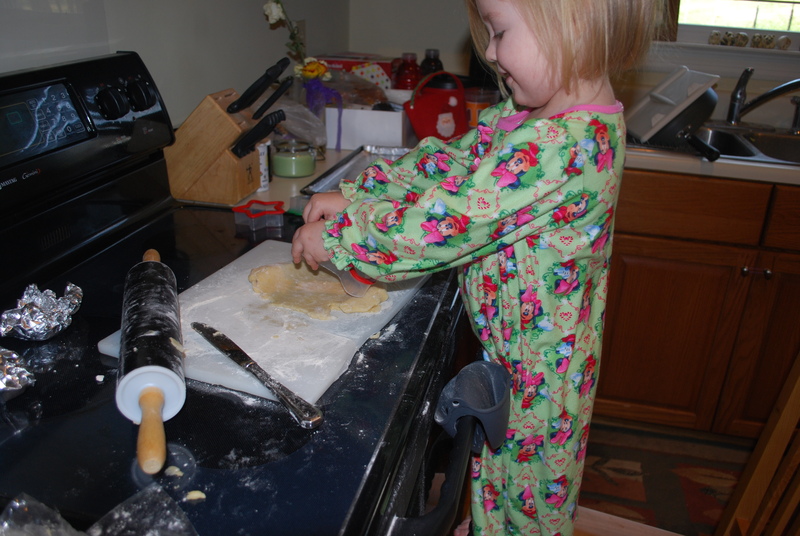 Ninnie helped me clean the kitchen, and we began loading up to head to Pappy and Papa Rod’s house for Christmas with my family. 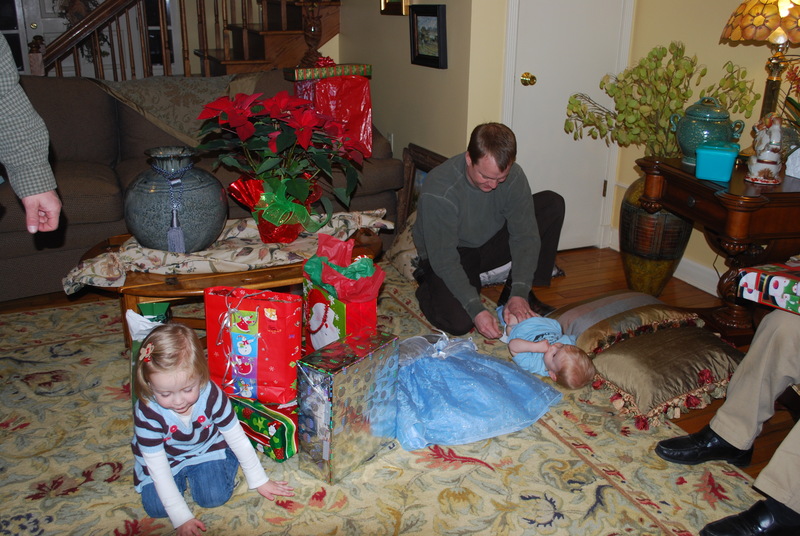 We were trying to get the kids dressed, and Chloe’s exhaustion really started to set in. She’s like her momma. When she gets really tired, she gets really silly. 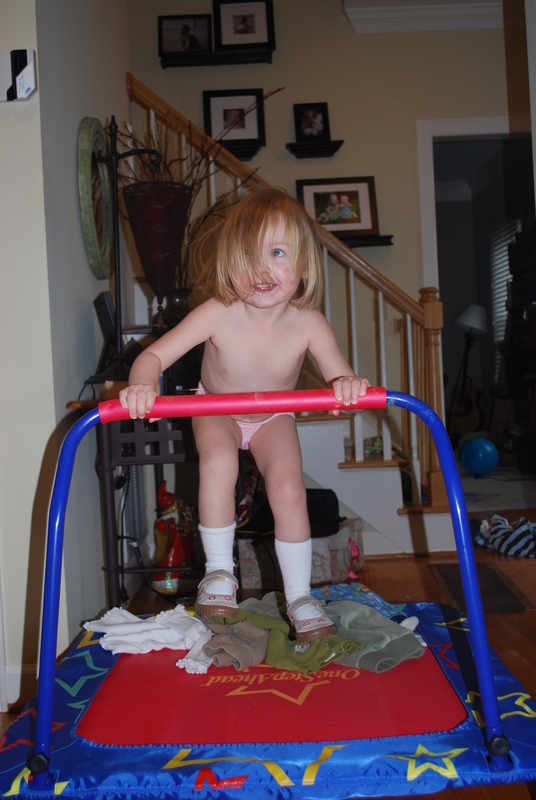 She ran from us when we got her pj’s off and went straight to the trampoline. You can’t really tell from the pictures, but her feet are in the air. Once everything was packed and loaded, we said good-bye to Ninnie and Big Poppa and head west. Pappy and Papa Rod, here we come! Christmas, round 3! I love, love, love Christmas Eve. 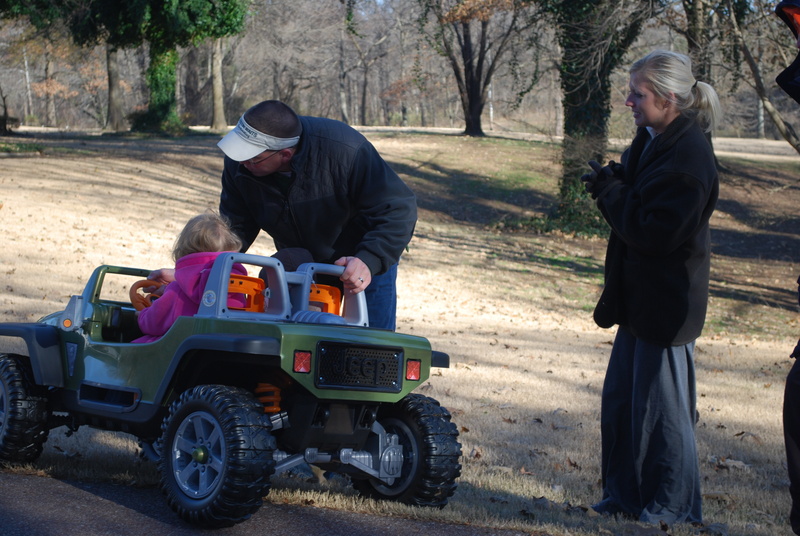 We had a lazy day, just the four of us, and then went to church late afternoon. Candlelight service is my favorite church service of the year, and I love having my kids with me during the service, no matter how much they misbehave. There is so much excitement in the air! 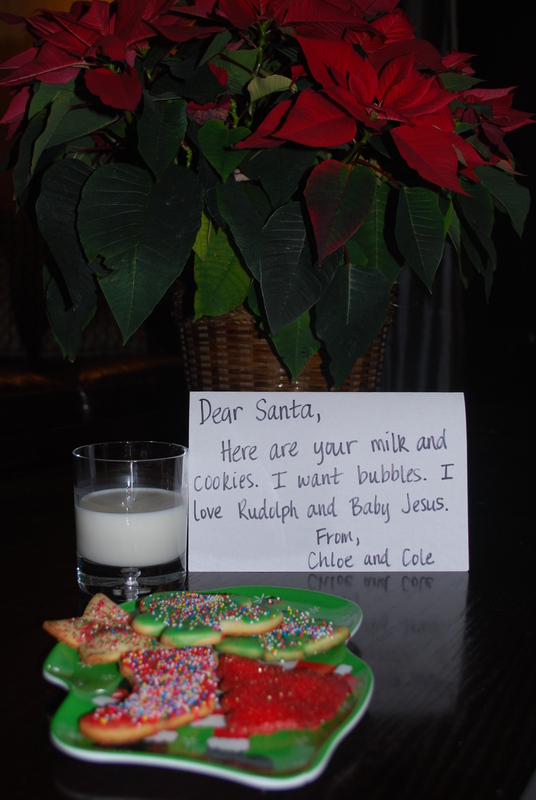 Both kids did very well, and I love that Chloe is starting to learn about Baby Jesus. Since church last Sunday, Chloe was telling us about Mary and Joseph and Baby Jesus and how he was born in Bethlehem. She seems to have learned a lot about the birth of Jesus this year. Things are starting to “click” with her. Ninnie and Big Poppa met us at church, and we all ate a good dinner afterwards. Then, it was bedtime! 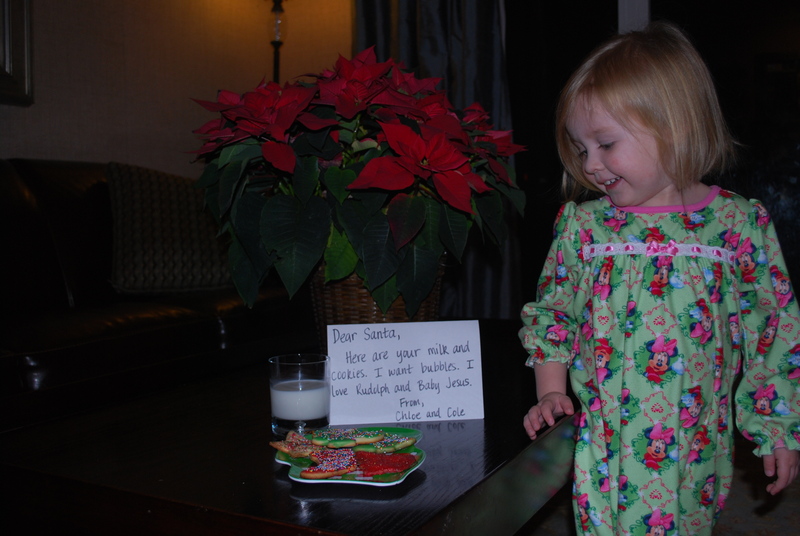 Santa comes tonight, so we left Santa his homemade cookies, milk, and a letter. 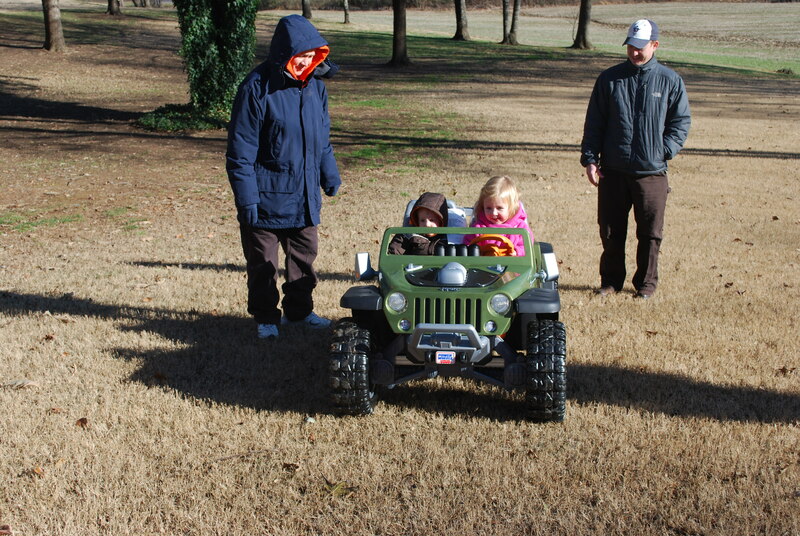 Cole didn’t make the picture….. he was already in dreamland! 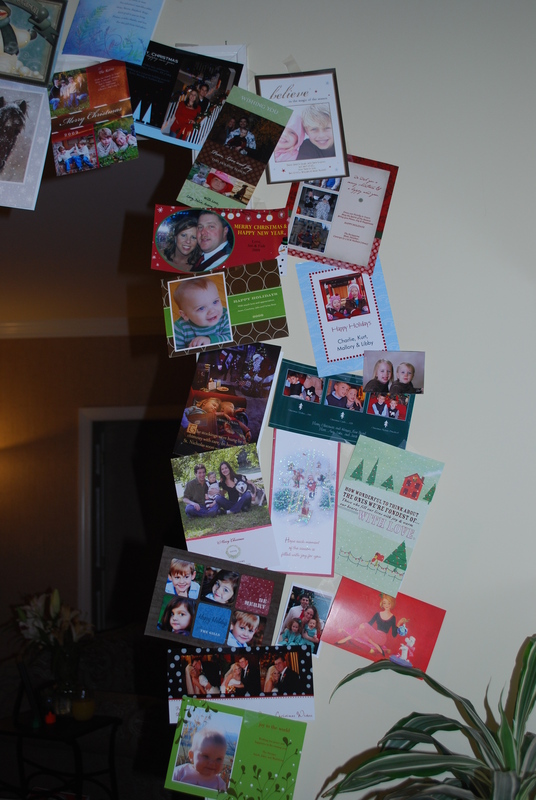 One of my favorite things about Christmas is Christmas cards. Throughout the month on December I can hardly wait for the mail to come. I can’t wait to get to the mailbox to see which cards are there. 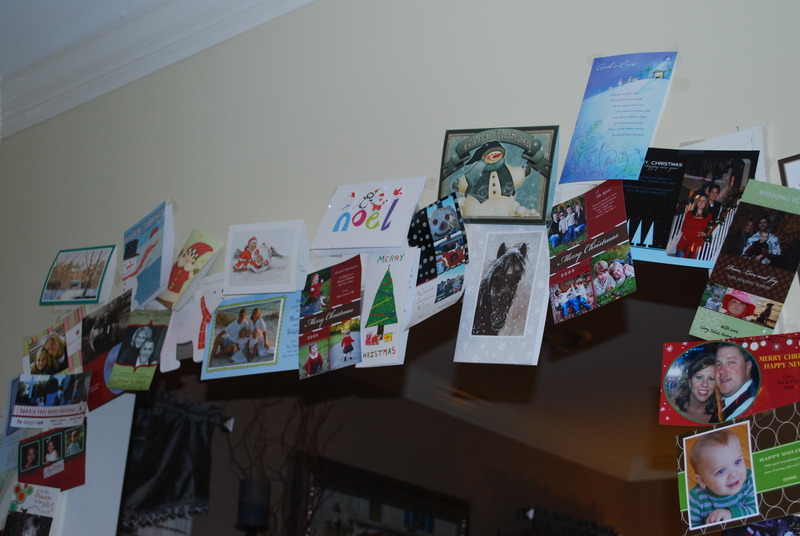 And, I get mad at Matt if he gets the mail before me, and I really get mad if he opens the cards….. I want to open the cards! It’s one of my favorite things about the holiday season. 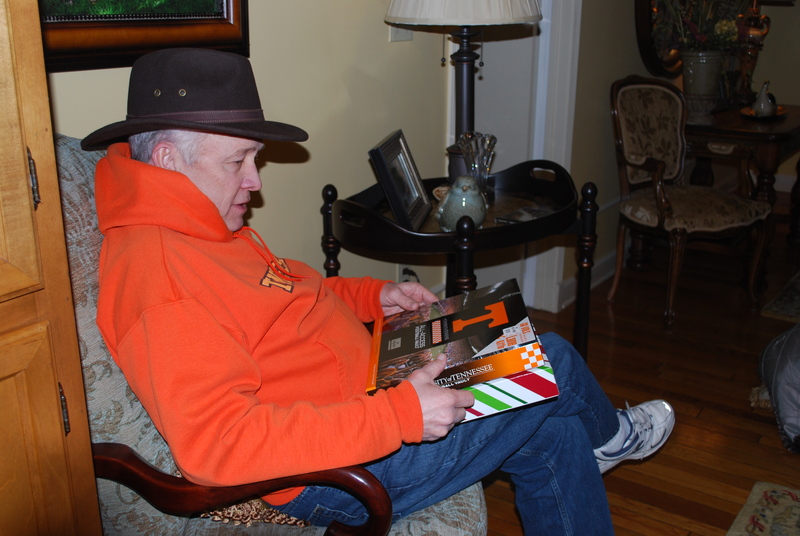 I love hearing from friends and family and seeing everyone’s picture. 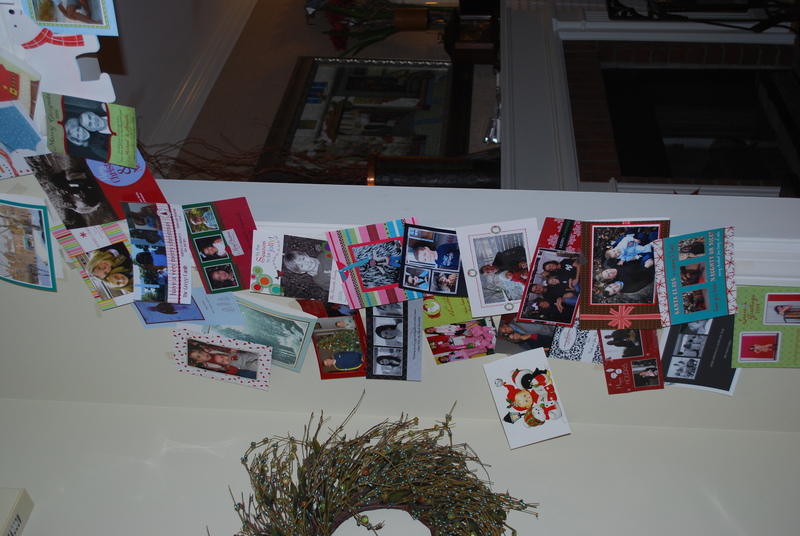 I hang them every year until Christmas is over, and I also keep them. I put them in an album along with all the birth announcements I receive throughout the year, and it’s a great scrapbook. I know…. pack rat! 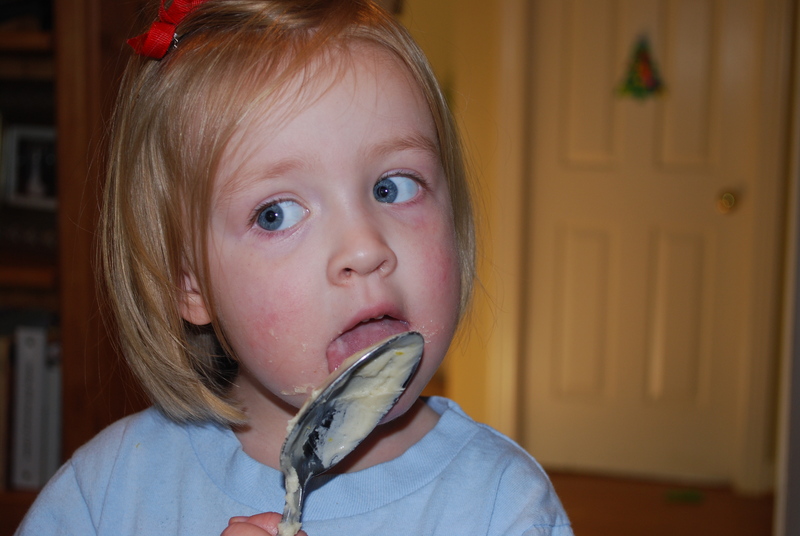 I’ve been telling Chloe for a while now that we are going to bake Christmas cookies together, and it is all she’s talked about. I should have read the entire recipe before starting because once we got the dough made, it said to chill it for 24 hours. 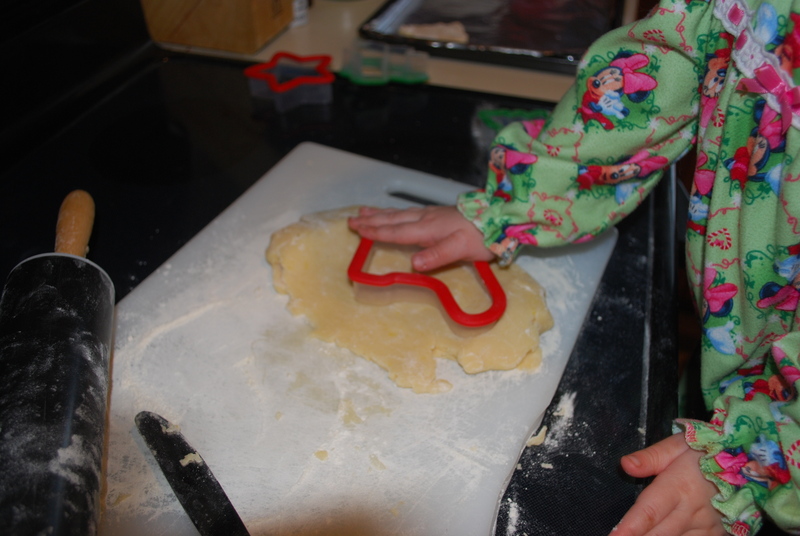 So, it ended up taking us 3 days to make Christmas cookies…. 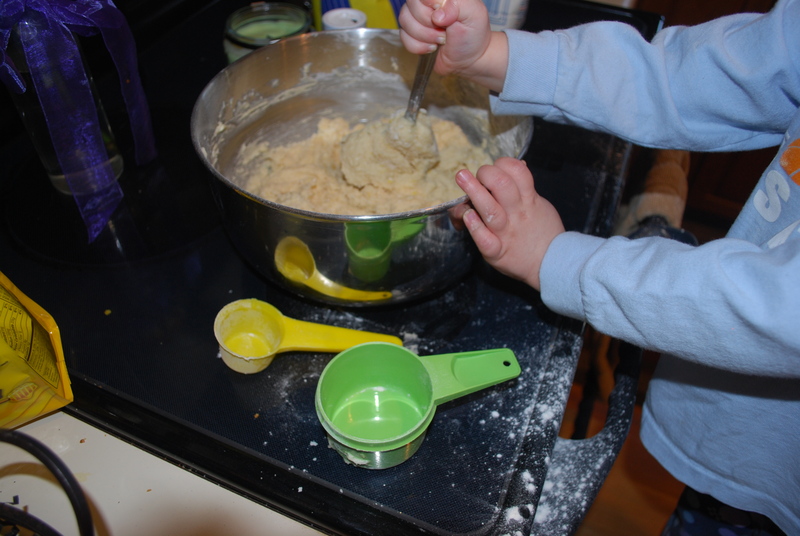 one day to make the dough, one day to bake the cookies, and one day to decorate the cookies. 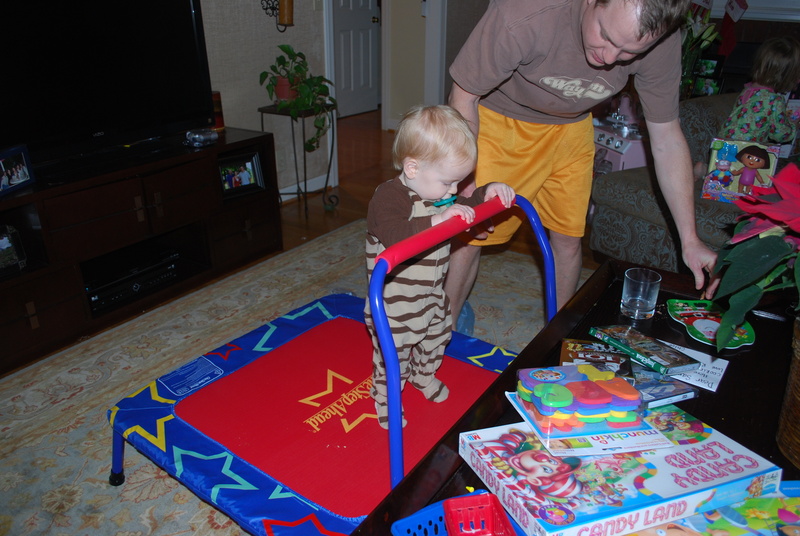 We probably could have finished the task in two days, but Cole prevented that from happening. 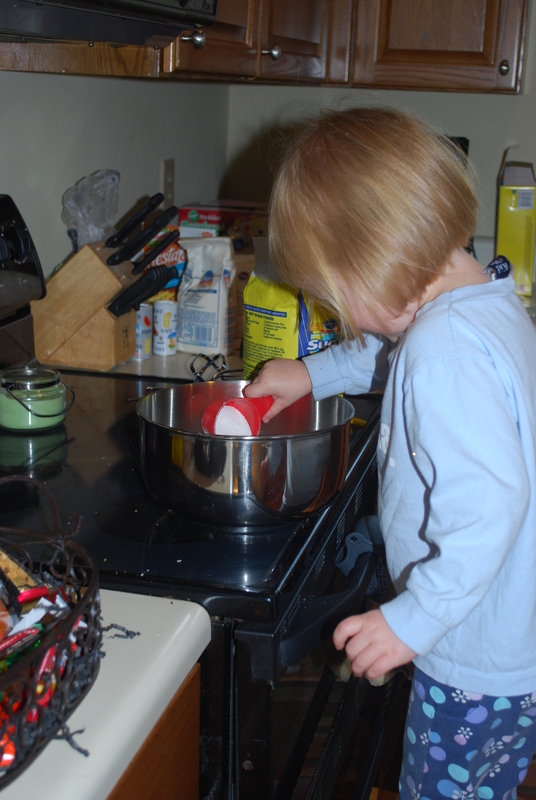 Chloe loved “cooking,” and she was a pretty good stirrer. 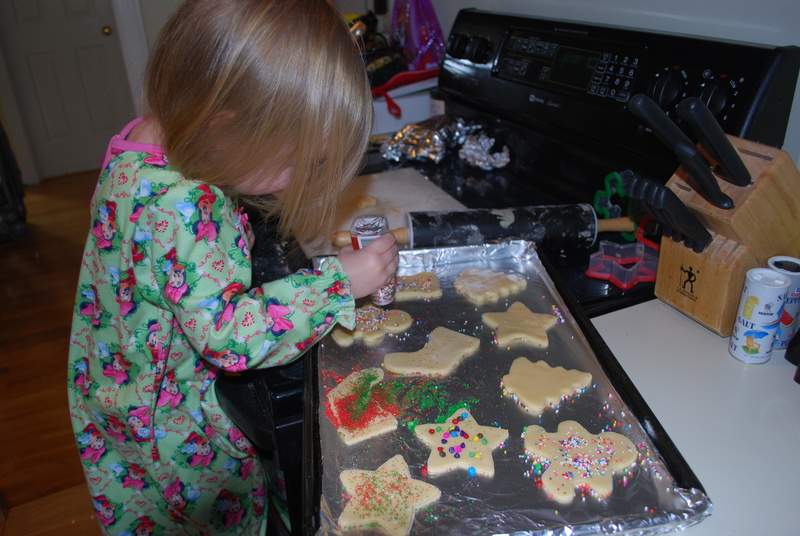 She did really well at sprinkling the flour and cutting the cookies with cookie cutters. 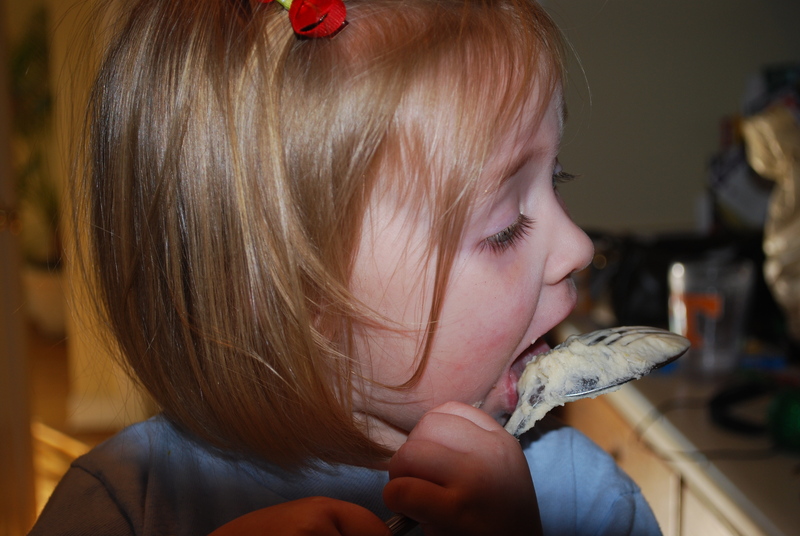 We were both a big covered-in-flour mess all three days, but our biggest messes were decorating the cookies. 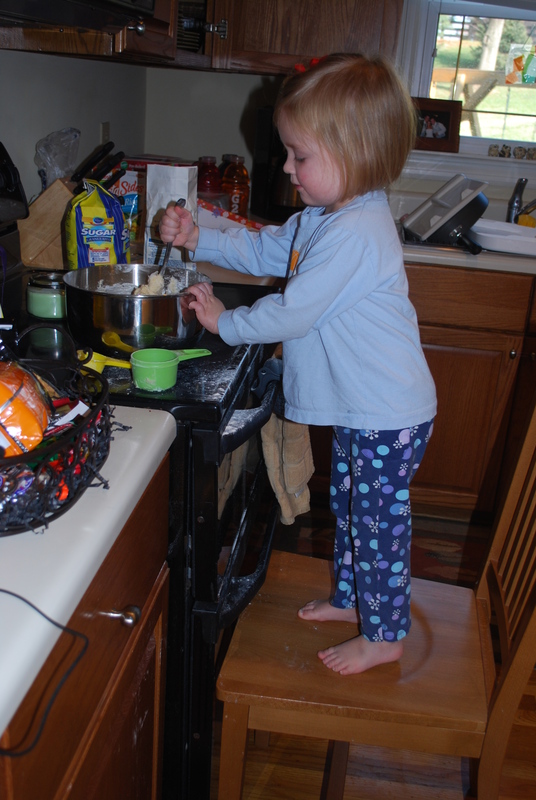 Chloe didn’t really understand how to lightly sprinkle the sugar or the sprinkles. It was fun, though, and I think Santa will like his cookies.